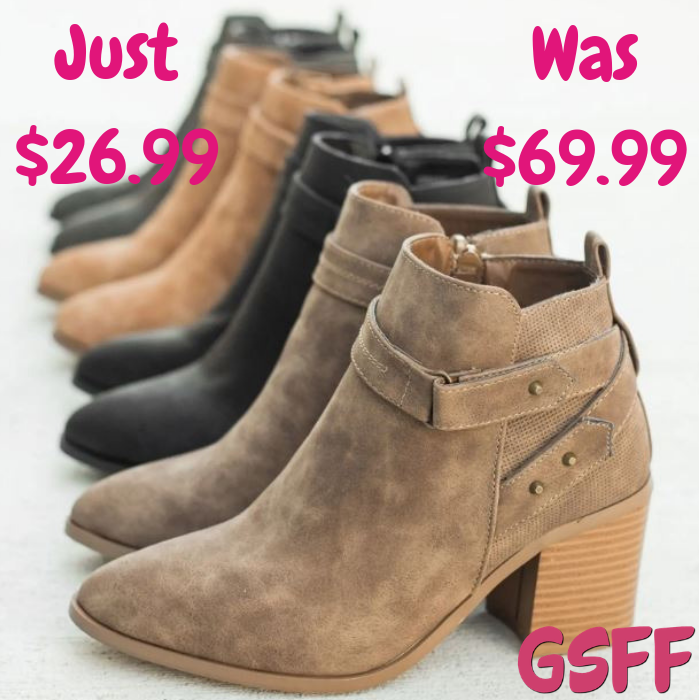 Fashion Booties Just $26.99! Down From $70! PLUS FREE Shipping! You are here: Home / Great Deals / Fashion Booties Just $26.99! Down From $70! PLUS FREE Shipping! Until November 23 only! Hurry over to Jane where you can score these Fashion Booties for just $26.99 down from $69.99 PLUS FREE shipping! There isn’t a single detail about these Fall Fashion Booties that I am not in love with! They are crafted with faux nubuck material and feature a closed/almond toe, cushioned insoles, and approx. a 4″ chunky heel. Complete the look in raw hem skinny jeans and a sweeper cardigan! It makes a great gift too!